Located in Maine at the easternmost point of the contiguous United States, the distinctive West Quoddy Head Lighthouse has stood watch over our coastline for over 200 years. With a distinctive look, an imposing height, and a light that's visible for many miles around, the West Quoddy Head is one of the finest coastal installations in the USA - and now, thanks to our dedicated Amish woodworkers, you can bring a taste of this incredible heritage to your garden, dock, or entryway. 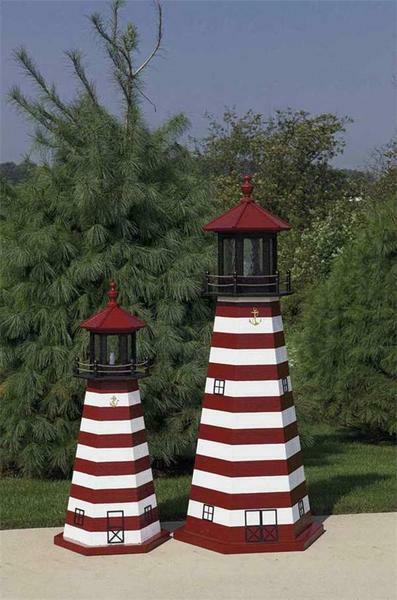 Choose from our wide range of sizes, colors, and lighting options to create your perfect garden lighthouse. Past customers have used this wooden replica to provide light to a dock or porch, to cover a well or a manhole, and even to add a signature element to their business's entryway! Plus, every single element of each lighthouse is handcrafted right here in the USA, bringing you nothing but the best in home-grown quality and attention to detail. If you're looking for inspiration or have any questions about this beautiful piece, please don't hesitate to get in touch with us by phone, by email or at our store in Florida - we would love to hear to you.